The constant hustle and bustle of the city streets throughout Illinois’s capital makes Springfield a dangerous place for bicyclists; and Springfield’s bicycle laws offer more protections to motorists than the bicyclists who are prone to suffering severe injuries when involved in accidents. In recent history, the city has laid out new infrastructure in the form of a connected system of trails to allow avid bicyclists safer options when riding, but it is still important to be aware of the laws that you must adhere to. The Springfield bicycle accident attorneys of Rosenfeld Injury Lawyers LLC are happy to answer any questions you may have regarding local bike laws and to help you recover the compensation needed when you’ve been injured. If your primary reason for bicycling is to engage in a more active lifestyle or as a recreational activity, it is much safer to ride the available bike paths than to share the city streets with motorists. The paths available include the Interurban Trail, which connects Lake Springfield to Chatham and consists mostly of private wooded terrain. For a more urban feel, you may wish to consider riding the Wabash Trail, which originates in Springfield’s commercial district, flows through residential areas and then follows what was once an old railroad track. 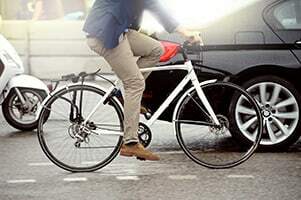 If you ride your bike to work every day or your planned route requires the use of city streets, it is important to understand Springfield’s bike laws so that you are not held liable for an accident and unable to claim compensation for the treatment of your injuries. Many of the laws mirror the laws by which motorists must abide, with the exception that bicyclists are the ones required to yield the right of way to motorists and pedestrians in most instances (See Springfield Code of Ordinances 81.03). The one exception to this rule is when a bike lane is provided— and drivers are then required to yield the right of way to bicycles occupying this lane. When exiting an alley or driveway, it is important to allow all pedestrians and vehicles to pass before entering the public street (Ordinance 81.09) and you are required always to signal prior to making any turns so that drivers are aware of your intentions (Ordinance 81.08). You must avoid riding on sidewalks when traveling through business districts and when using the sidewalk where permitted, you must always yield to pedestrians (Ordinance 81.12). Finally, you must make every effort to make others aware of your presence through the use of a headlamp and reflectors at night. You may use bells as audible signals, but are prohibited from equipping your bicycle with a siren (Ordinance 81.13). It is always a good idea to wear safety equipment when operating a bicycle, but protective equipment still offers limited protection from injury when you are involved in an accident with an automobile. Even if you share liability, it may still be possible to recover damages in proportion to the other party’s liability in the incident. Never admit fault in an accident and consult a Springfield bicycle accident attorney to determine whether you are entitled to compensation for your injuries. The damages you receive can pay for the costly treatment of injuries which include the following. Injuries to the head or brain. Neck, spine and back injuries. Rosenfeld Injury Lawyers LLC can help you maximize your recovery by coordinating with accident reconstruction specialists, medical professionals and economists to prove fault and accurately assess the cost of your medical treatment, out of pocket expenses and any costs you are liable to incur during the future for the treatment of your injuries. Contact us today to schedule a free consultation with one of our Springfield bicycle accident lawyers. If we are unable to collect compensation on your behalf, our services will be free of charge.